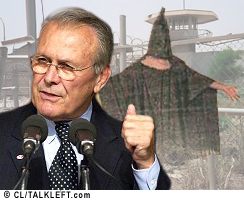 Donald Rumsfeld is back. He's embarking on a round of media appearances to promote his new book, Known and Unknown, which reportedly is filled with something called "Rumsfeld's Rules." [H]e says "Known and Unknown" will take on the most sensitive subjects, from the detainment facility at Guantanamo Bay, Cuba, to the mistreatment of prisoners at Abu Ghraib in Iraq. "I brought in people who were involved and outside advisers to discuss the legal decisions that were made. And in the book, I present them in a direct way," he says. Here's a media event in D.C. that's taking invitations. Defense Secretary Donald Rumsfeld got a big Pentagon send-off today. Combative to the last, Rumsfeld took a slap at advocates of withdrawing U.S. troops from the war, now in its fourth year with more than 2,900 Americans dead. "It may well be comforting to some to consider graceful exits from the agonies and, indeed, the ugliness of combat," Rumsfeld said, choking up slightly as he capped a roster of speakers at his pomp-filled goodbye ceremony. "But the enemy thinks differently." Memo to Mr. Rumsfeld: Don't let the door hit you on the way out.